Ideal for connecting hub-to-hub, PC-to-PC, or Mac-to-Mac computer. Easy to connect computers on your Local Area Network (LAN). Ideal for hubs, switches, patch panels, routers, DSL/Cable modems, and other networking applications in high noise environments. Ideal for network adapters, hubs, switches, routers, DSL/Cable Modems, patch panels and other computer networking applications. Designed to mount in various face plates/surfaces. It offer a clean and convenient connection to your RJ45 Ethernet network. Protect the wear and tear of RJ45 ports! Perfect for a tight space or the port is being used for testing purposes. Ideal for connecting two devices, such as computers, game machines directly. Allowing the devices to bypass the hub or switch. 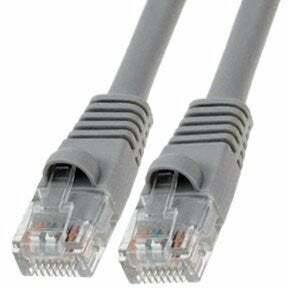 Cat5E ethernet cables are enhanced version of Cat 5 cables and theoretically, support speeds of upto 1 GB. Cat5e cables also ensure less crosstalk than Cat5. At SF Cable we stock a variety of Cat5e network cables. Our collections includes Cat5e cross patch cables, Cat 5E patch cables booted, Cat 5E patch cables non-booted, Cat5e shielded patch cables and Cat5e shielded crossover cables. Our Cat5e cables come in various colors and lengths. SF Cable is a one stop solution for all your network cable requirements. We provide high quality Cat5e cables at low prices by sourcing them directly from ISO 9001:2000 certified manufacturers.